Doncaster RLFC overcame University of Gloucestershire All Golds as they cruised to a 40-8 win in their League One season opener at the Keepmoat. After relegation from the Championship last term, coach Gary Thornton’s new-look Dons side were heavily fancied ahead of their first league outing, and new signing Kieran Cross stole the show as he helped himself to a hat-trick with a man of the match display. 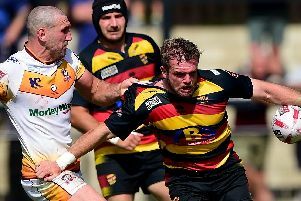 Thornton said his side would have to make their home a fortress if they were to bounce back at the first time of asking, and they ran in seven tries to get their campaign off to an impressive start. The Dons opened the scoring after just 11 minutes courtesy of Louis Sherriff, when the stand-off dummied a pass before locating enough space to power through, with Tom Carr successful in converting from a slight angle to give the home side a 6-0 lead. George Milton created the space and switched inside with some neat handling to gift Cross the game’s second try with 14 minutes on the clock. That gave Carr an easy second conversion from under the posts, and Dons were well in the ascendency. Visiting winger Phil Cowburn fumbled a catch shortly before the 20 minute mark but the away side held firm from the resulting 10-metre scrum. The home side were forced to show their defensive credentials as Gloucestershire made inroads in the following ten minutes, but it was Doncaster on target once more shortly after the half hour, when Kirk Yeaman broke through on the left hand side to touch down and give the Dons a 16-0 half time advantage. Despite being a man down early on in the second half after Emmerson Whittel was shown a yellow card, it was the All Golds who struck back, as Cowburn broke free from inside his own half to race over in the corner for his team’s first try of the day. And the pressure continued after the try. Shortly before the hour mark it told once more, with the All Golds securing a second through Jamie Murphy, this time down the right wing, giving the Dons plenty to think about with 20 minutes left on the clock. However, the game was all but over with 12 minutes left as Cross broke away for his second, and Dons’ fourth try of the game, after great work by Sherriff. Carr converted to make it 22-8. It was Cross who then ensured a handsome margin of victory with his third try in the 73rd minute, before finding George Milton with five minutes left for Dons’ sixth try. The floodgates were well and truly open as two minutes later, David Foggin-Johnston ran in a seventh and final try. Doncaster: Carr, Foggin-Johnston, L Welham, Yeaman, Jones-Bishop, Sherriff, Hedges, Scott, Cross, Aizue, Tonks, Foster, Milton. Subs: Kesik, Walton, Nicholson, Paleaaesina. University of Gloucestershire All Golds: Leather, Murphy, Allison, Kislingbury, Cowburn, Davies, Newton, Purslow, Parry, Evans, Bryan, Reece, Whittel. Subs: Lombardo, Elliott, Kidd, Davidson.